Brinder specialises in crime, both prosecution and defence. She is regularly instructed in serious assaults, sexual offences, child abuse, drugs, serious robberies, fraud and POCA applications. Brinder prosecutes for a number of local authorities, DWP and the National Probation Service. 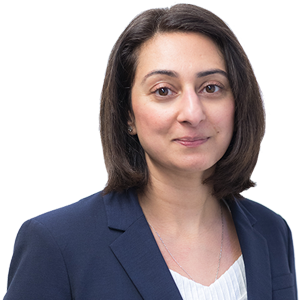 Brinder has a particular interest in defendants with mental health difficulties. R v A & Ors – Led junior in a 5 week trial in a murder by stabbing. Complicated issues dealt with included a dying declaration, hostile witnesses, waiver of privilege in the context of a cut throat defence and a number of bad character applications and cross-applications (Defence). R v M – 15 counts of knife point robberies, stabbing, carjacking, kidnap, handling stolen goods and dangerous driving (Prosecution). R v M – Fraud involving investments in property and banks in Spain. POCA proceedings followed (Prosecution).